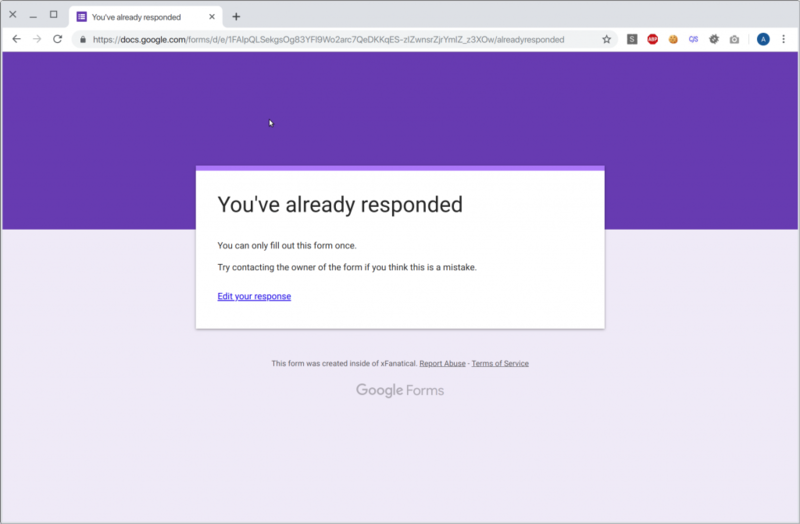 One day you woke up and feel excited that you got thousands responses for your Google forms survey. When you opened the spreadsheet, you’re staggered. Most of responses are garbage spams. Some guys hope reCAPTCHA to be integrated with Google Forms. At least at the moment of writing this article, such integration is yet to come. So how do you fight your forms from being spammed? We shows you 3 imperfect workarounds to reduce spams. Just like flu, we can get flu shots for a season protection, but we cannot be immune from spams forever. First of all, we assume you published a naked google form on social medias or embedded in your own site. Anyone can discover the form link and submit answers without any restrictions. The old school password strategy is easy to understand. Secure. If you have a long strong password, it’s hard for spammers to break into. Dilemma. If you don’t share the password with the public link, no one can submit any answer. If you shared, it makes no senses. Add a Short answer question, named Password. 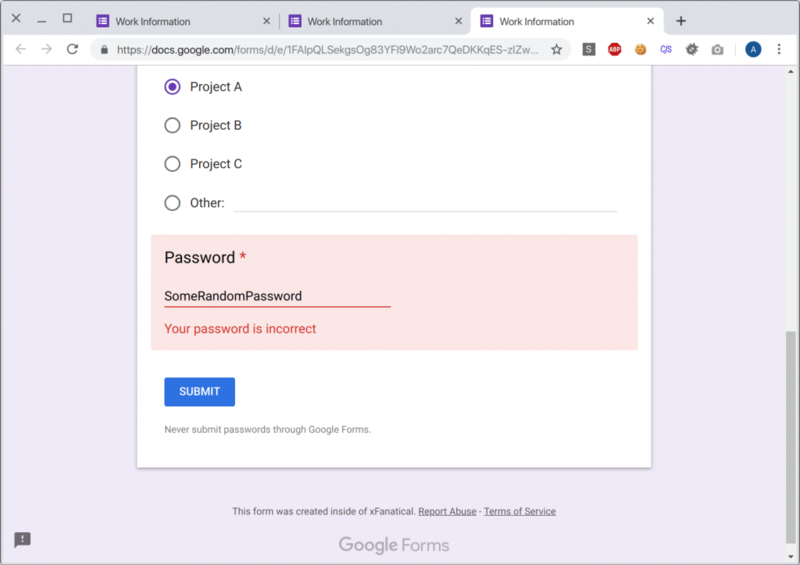 Type in a long and strong password and an error message when respondents typed a wrong password. Now try to submit a response with a wrong password. You will find you cannot. It tells you the password is incorrect. This method is apparently the easiest since it’s one click. This method will more or less slow down spammers and thus decrease the number of spams. May lower conversion rate for the extra step. In the General tab, check the Limit to 1 response option. 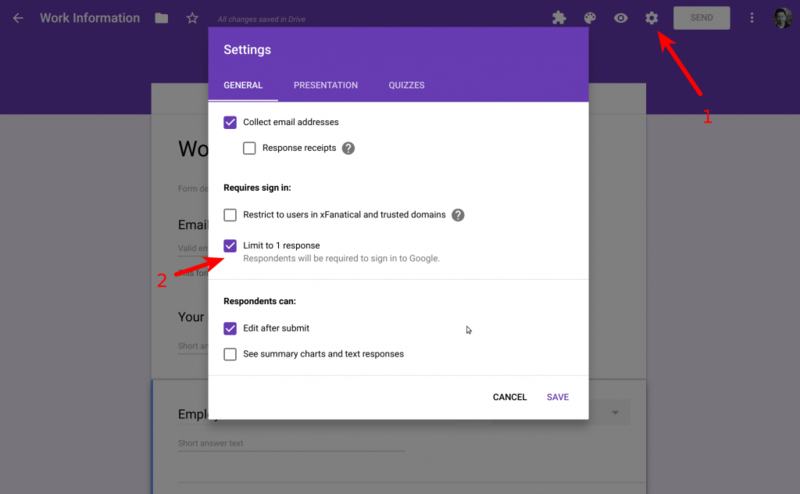 When you are done, any respondents without their google accounts logged in will see the following screen. When they want to re-submit another spam answer, they will be blocked. This method relies on a form addon to work, named Captcha for Forms. It adds an additional security layer without compromise of flexibility. The addon adds a dynamic captcha code challenge for respondents. Unlike the dilemma using password method above, the tool is able to expire the captcha frequently so no permanent spamming is possible. Download and install Captcha for Forms. You may follow this full installation guide. 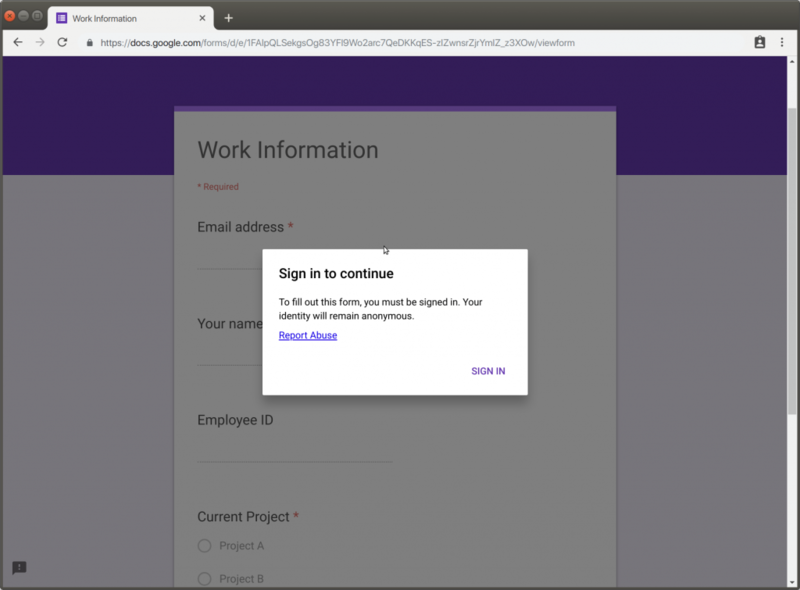 Once you are done with installation, open Captcha for Forms from the menu. In the popped sidebar, turn on Enable Captcha. Now let’s see the respondent’s screen. It’s difficult for bot to respond the captcha challenge but human. Anti-spam is an endless game. Please leave any comments if you have any questions.